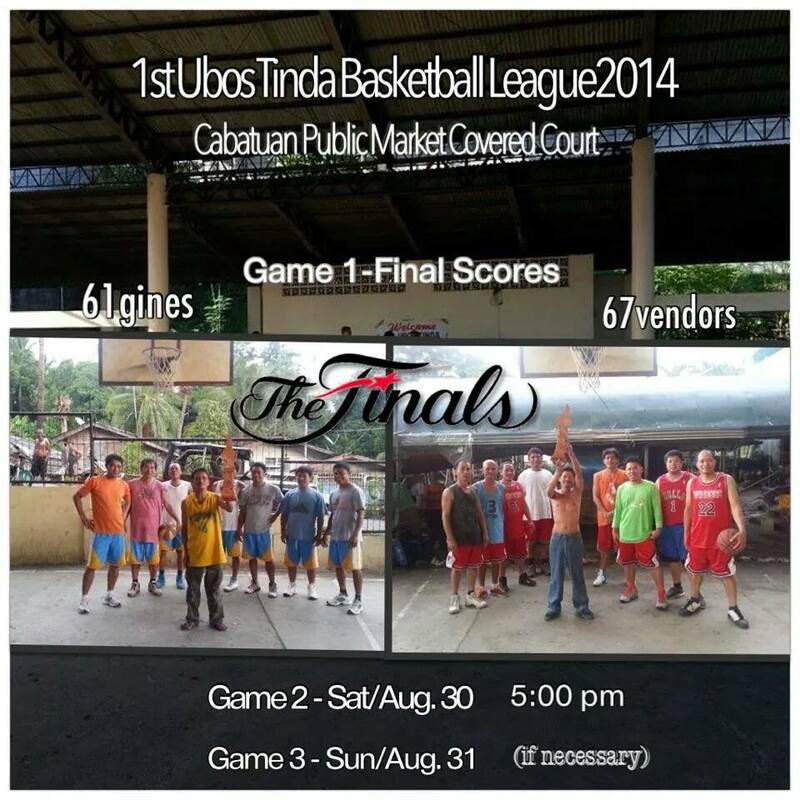 1ST UBOS TINDA BASKETBALL LEAGUE 2014. TO PLAY GAME 2 TODAY, SATURDAY, AUGUST 30, 2014. Game 1, played on August 24 at 5:30 PM, was won by the Vendors, with the final score of 67 - 61. It was originally scheduled on August 23 at 5:00 PM, but was cancelled due to a blackout. If necessary, Game 3 will be held tomorrow, August 31, 2014. Meanwhile, the battle for 3rd place (one game only) was won by Arangkada over Banguit last August 23, at 4:30 PM, before the scheduled Game 1 of the finals. Due to blackout, only the Arangkada-Banguit game was played. 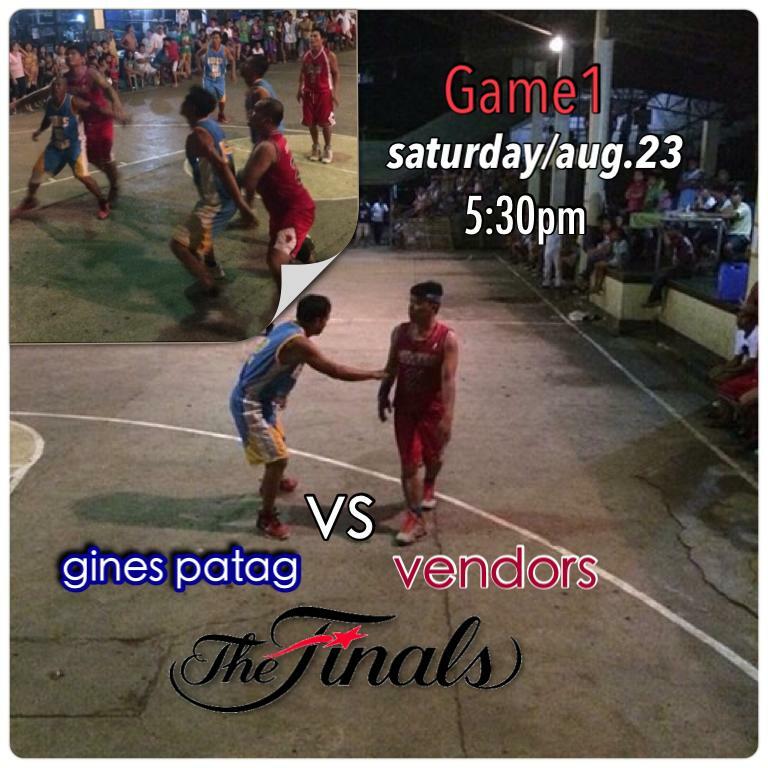 Game 1 of the finals was rescheduled the next day, August 24 at 5:30 PM. The players of Arangkada are Philip Yap, Herp Curate, Dennis Caballero, JC Belenio, Greg Domejes, Raul Defante, Nono Defante, Bagyo Gallana, Jjonel Defante, Ramil Condino, Agustin Navarro, James Lapian, Luter Lawas, Jimmy Garido, Fr. Jack Panganiban & Chief of Police. The players for Banguit are Mulong Huesca, Medel Huesca, Bong2 Huesca, Jimmy Huesca, Bebot Soldevilla, Arnel Olmos, Joeven Soldevilla, Leo Montano, Glenn Pineda, Uding Ollosa, Turing Tiongson, Totong Yniego, Dan2 Juntaria, Philip Cortez & An2ny Caballero. The Arangkada team is representing the Cabatuan Local Government Unit.